Written by Ramya Gopal and Aparna Ananthasubramaniam on April 20, 2018 . As demonstrated in MAF’s Hierarchy of Financial Needs, a stable income is the foundation of financial security. Income is essential to realizing your economic potential. 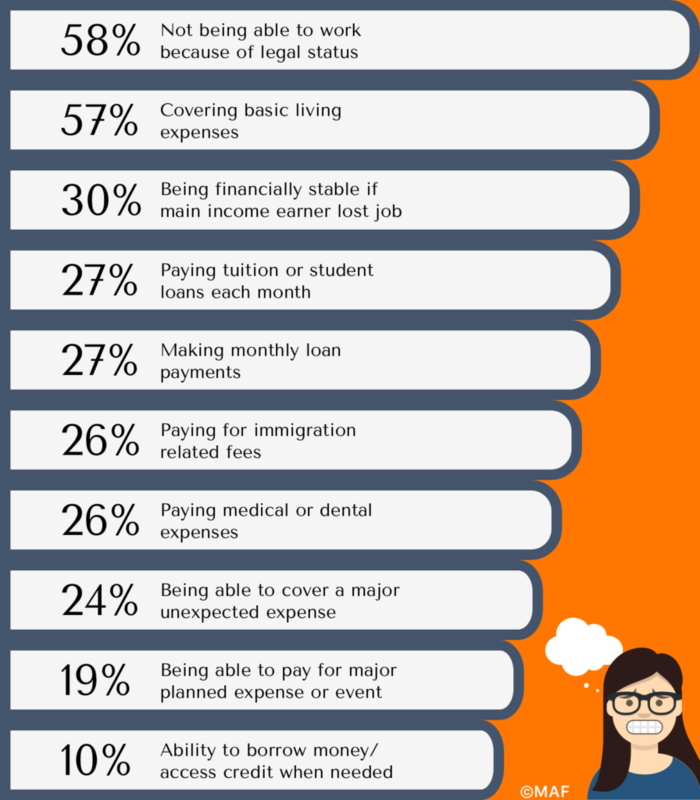 Yet 58% of DACA recipients we surveyed are worried about not being able to work because of their legal status and 57% are worried about their family’s ability to cover basic living expenses. Maintaining economic stability is a top concern for them. DACA recipients shared many different concerns with us openly through the survey about their education or how they might lose their jobs. We also heard from survey respondents that many of them are turning to self-employment as a means of supporting themselves. With increasing ICE raids and mixed-status families being separated, DACA recipients have a lot to worry about. Yet we continue to see their resilience and creativity. This data helped MAF realize we can help DACA recipients secure stable, quality employment by providing programmatic support around starting their own businesses and working for themselves. *For this particular question, respondents selected up to 13 answers that applied to them.